Travisville UMC music directors Phyllis Roysden, Lyllis Byrd, and Danny Byrd prepare to lead Gospel singings this year. 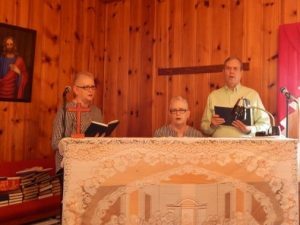 Made possible by a grant from the Golden Cross Foundation, the singings and other older adult ministries such as Bible studies, outreach, and holiday meals will benefit both congregation and community members in Pall Mall, Tennessee. Travisville United Methodist Church in Pall Mall, Tennessee, received a $1,000 grant from the Golden Cross Foundation, a non-profit corporation and extension ministry of the Tennessee Conference of The United Methodist Church. Money from this grant is being used to start an older adult ministry.